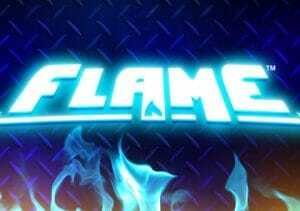 If you like plenty of variety in your gameplay then Flame, a NextGen Gaming video slot delivers plenty. It’s a 5 reel, 20 payline game that comes with no fewer than 7 modifier extras that offer an assortment of transforming symbols, wild extras, win both ways pays and much else besides. There’s also a bonus round that awards up to 30 free spins. Play on your computer, tablet or smartphone from between 15p and £150 per spin. Cross Flare feature – after landing a winning line, a payout can be made from left to right or right to left. Whichever is higher is paid. Better still is if you land a 5-of-a-kind winner as it pays both ways. Flare Up feature – your payout is boosted by a multiplier of 2x, 3x, 5x, 7x or 10x. Fire Whirl feature – any (or even all) of the 5 reels can become engulfed in flames. Any higher value animal symbol on a flame covered reel awards a special bonus prize of anything between 1 and 20 times your total stake. Live Embers feature – trigger this and any heart, diamond, club or spade symbol on reels 2, 3 and/or 4 turns into a wild. A payout calculation follows with the extra wilds. Spontaneous Combustion feature – all of the fire, lightning, water and leaf symbols on the reels all transform into the same matching higher value animal symbol. Wild Inferno feature – this extra can trigger on any spin where a wild is present. After the normal payout, a re-spin is awarded with any wilds on show locked in place. More re-spins are awarded as long as a new wild hits before a final payout with all those lovely wilds in position is made. Firestorm feature – the wild and bonus symbols on reels 2, 3 and 4 morph into combined wild/bonus symbols. The wilds help create winning combinations, the bonuses help trigger the Free Games feature. That Free Games feature is triggered by landing 3 bonus symbols on the middle 3 reels on the same spin. You’ll then receive 15 free spins. You can expect to see the Flame modifiers hit more often during the free spins too. What you’ll be hoping for is the Flare Up feature as you can benefit from a huge 10x multiplier on each free spin – you can also win another 15 free spins if you retrigger the feature. The futuristic visuals are solid enough but we were slightly baffled by the theme here. That doesn’t really matter though as there’s so much variety on offer here from the modifiers and free spins. If you enjoy plenty of extras then Flame has much to commend it. Despite the range, we found them quite tricky to hit. The free spins undoubtedly provides the best chances. Get on a good run with the modifiers there and Flame can cook up some pretty scorching action – just over 1,200 times your total bet on each spin. If you like big multipliers, Playtech’s X-Files offers them up to 25x!